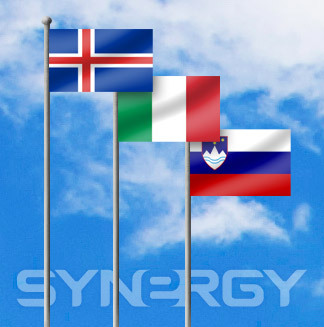 Synergy WorldWide is furthering its international growth and pre-launching in three new countries: Italy, Slovenia and Iceland! This is the first step in welcoming new markets to the Synergy experience. We couldn’t be more excited to increase our reach and share Synergy’s life-changing values and products with even more people. As of today, August 1, 2013, potential distributors in Italy, Slovenia and Iceland can join our team. See the links below to find your pre-launch form and get started! After you fill out the pre-launch form, refer to the contact information listed on the form and send it to our corporate office. Click here to access Italy’s pre-launch form. Click here to access Italy’s pre-launch form in English. This is just the beginning of many things to look forward to in Italy. Now that we have reached the pre-launch phase, we can look forward to Italy’s full launch in October 2013. At this time, Synergy’s distributors in Italy can expect to order product, receive commission, and have access to Italian versions of all essential resources—brochures, videos and forms—that Synergy provides to its Team Members. Synergy’s Italian website and back office “Pulse” will also be accessible. Italy will have everything necessary to foster thriving businesses and change people’s lives with the Synergy Advantage. Click here to access Slovenia’s pre-launch form. Click here to access Slovenia’s pre-launch form in English. By early September 2013, Synergy will execute a soft launch in Slovenia, giving distributors in this country the ability to order product, receive product and earn commissions. Slovenia’s full launch is slated for 2014. Click here to access Iceland’s pre-launch form. Click here to access Iceland’s pre-launch form in English. By early September 2013, Synergy will execute a soft launch in Iceland, giving distributors in this country the ability to order product, receive product and earn commissions. Those interested in accessing English distributor resources can do so. Incredible opportunities await Synergy WorldWide in each of these countries. We are excited to see what the future holds!